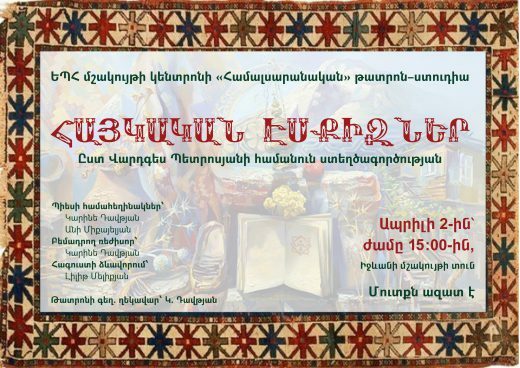 Dear Universitarians, YSU Ijevan Branch is pleased to inform that on the initiative of YSU Cultural Center the essay-novel “Armenian sketches” by Vardges Petrosyan are to be staged in Ijevan Cultural Center, on April 2, 2019. The authors of the performance scenario are Karine Davtyan,the director of YSU Cultural Center and Ani Mikaelyan, the stage director is Karine Danielyan, designer of the costumes is Lilit Melikyan, and the cast is the students of “Hamalsaranakanner” theater-studio of YSU Cultural Centre. One professional actor, Samvel Baghinyan, is invited to embody Andranik Ozanyan’s character. The essay-novel “Armenian Sketches” by V. Petrosyan tells about the difficult path of the Armenian people, its obstacles, revolutions and wars, their consequences, the Armenians around the globe, and the image of a true Armenian. The authors of this performance have done editorial works as well as additions about Artsakh and April four-day wars and their heroes. The authors of the performance create a new format of patriotic theme, which aims to spread patriotic ideas among today’s generation, and the importance is given not to the mourning and loss, but to the one who fights for his own country, the creator and the type that lives for it.